You would think that replacing a basement door would be a simple weekend project, right? You would be so wrong because, in this house, no project is ever quick or easy. This one took us 3 months to finish. Yup, we started way back in January. We didn’t work on it the whole time, but it did take a lot longer than we thought. This is where we began. The basement door is in our small living room so we have to look at it every night when we watch tv. It really doesn’t look all that bad in the photo but it was. 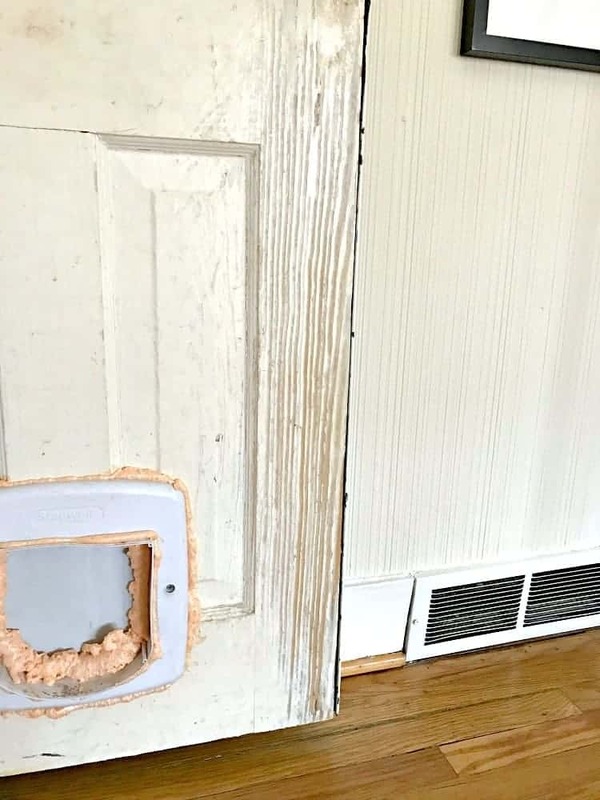 The dog/cat door was big and bulky, chewed up and glued shut. The inside of the door was plain old nasty. I think the previous owners locked their dog in the basement and it chewed and clawed the door. You can also see the lovely pink spray foam insulation. Insulation is a good thing and has its place, but this stuff is everywhere in our house. All I know is that whoever sprayed it certainly did a thorough job. Yikes! The first thing we had to do was to remove that ugly door. Both the door and the frame had metal stripping around them, to make a good seal, so it all had to be removed too. After we removed all of the metal strips, we had to scrape the old, chippy paint and repair all the holes. The only problem was that the door was a mess. It needed to be scraped and sanded on both sides before it could be painted. Even after we sanded and painted the door it was far from perfect but, when you have an old home, nothing is perfect. 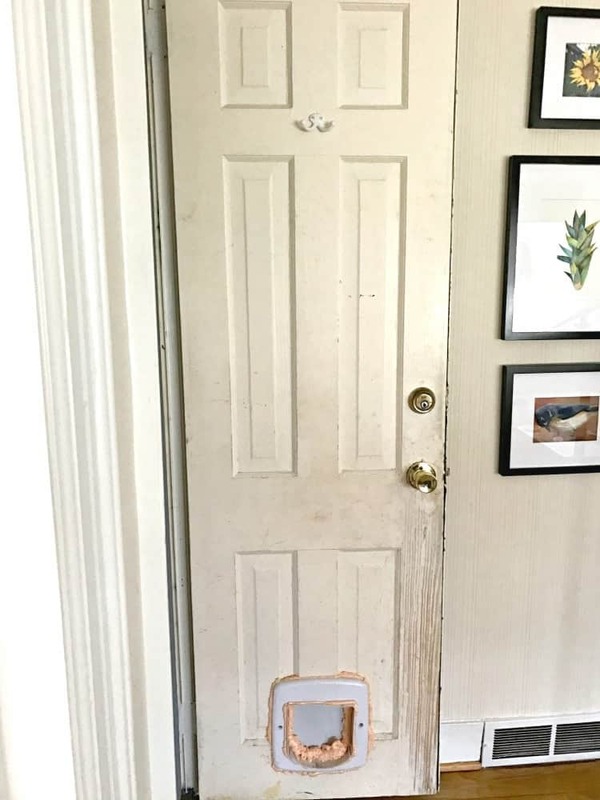 So, instead of looking at the ugly door, we looked at an open doorway and 2 boxes for 3 months. The boxes were our idea of a cheap baby gate to keep Finn from wandering into the basement. I tried to recycle everything when I could, including the hardware, but it just wasn’t useable. The door knob was old but not original glass like the others in the house and the metal hinges were caked with paint. I replaced the old generic knob with another glass knob from Nostalgic Warehouse, exactly like the ones I used in the bathroom recently. I can’t tell you how much I love them. 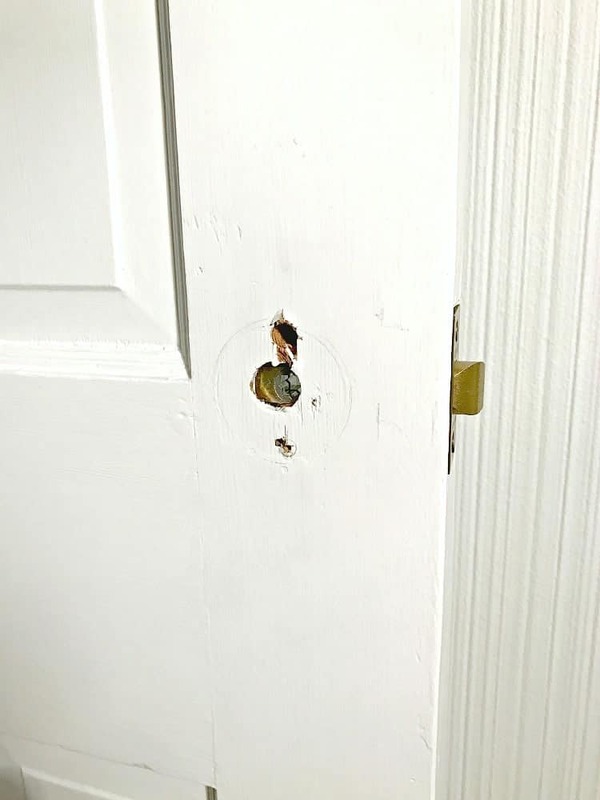 We had to modify the door a bit to get the new door knobs to fit. Luckily the new door knob plate covers the ugly holes. I think it looks so much better than it did before. Like it’s been here all along. I’m so glad that we found this door in the basement. 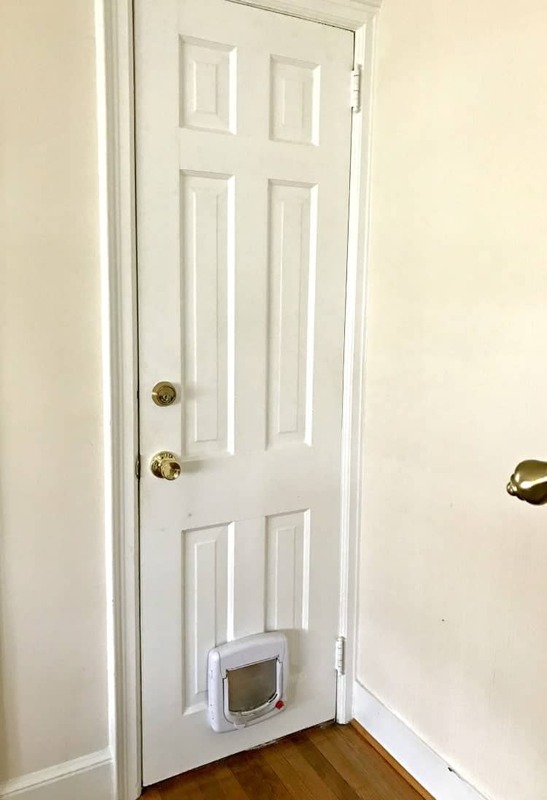 Finding a new door that matched the others would have been tough, and expensive. Another project crossed off the long list. Progress! 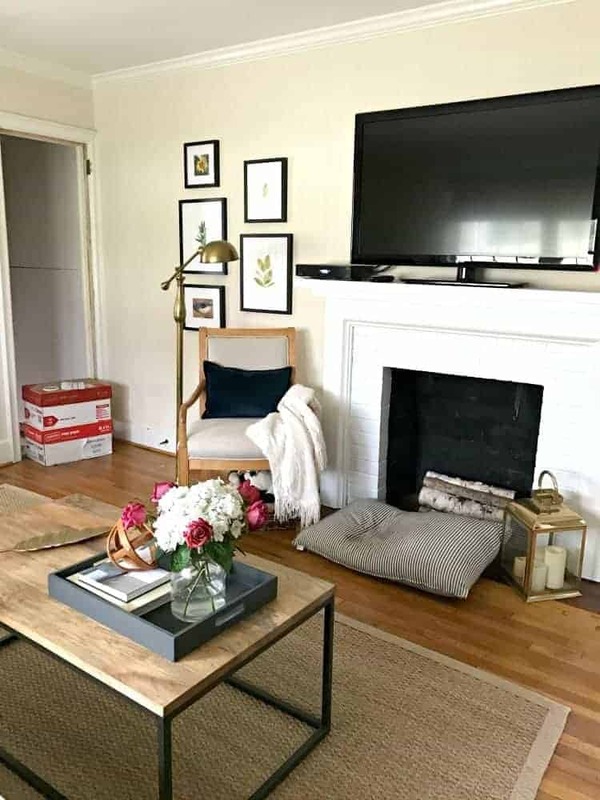 Check out another project that we recently completed in the living room, the DIY fireplace mantel. 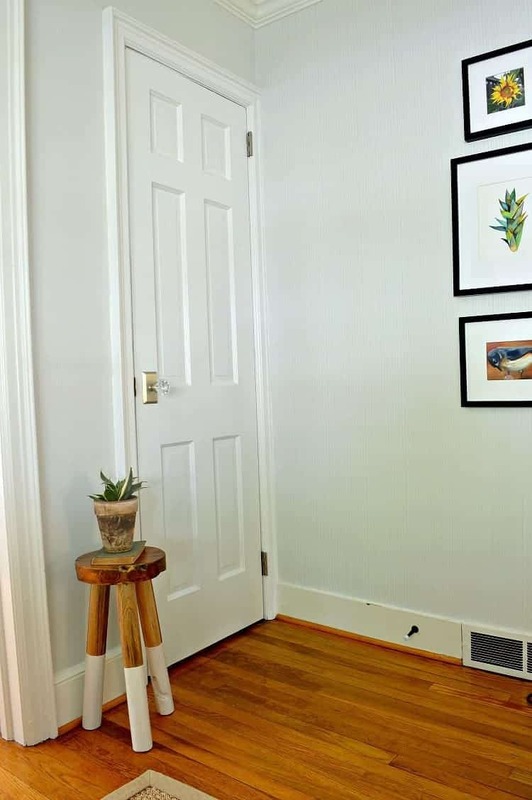 The “found” door looks great and definitely looks at home there. None of our doors/jambs are square, and this is a nearly new build. Also that poor dog. Thanks! I think we lucked out in finding the door. There’s more dog damage to the woodwork in other rooms (an out deck) so it will need to be changed too. 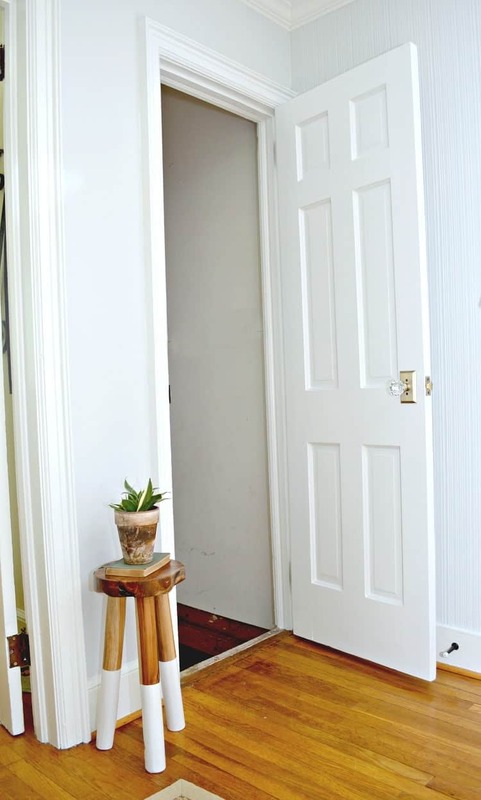 What a difference the new door makes in your living room! Great job. I was noticing how beautiful the wood floors are too. I wish I was going to the flea market with you. Is that the big one in Greensboro? Been there, such fun. I’d love it if you could come to the flea market too. It’s actually in Liberty and they have it twice a year. I’ve been looking forward to going for weeks. Well, I for one am saying “WOW!” It has mad a huge difference, and as usual, you did a beautiful job. Now where is this antique show?! Thanks so much Pat, I appreciate your “WOW!”. 😉 I think it made a huge difference too. The antique show is in Liberty, NC. They have it twice a year and it’s really a great show. Your house is so pretty. 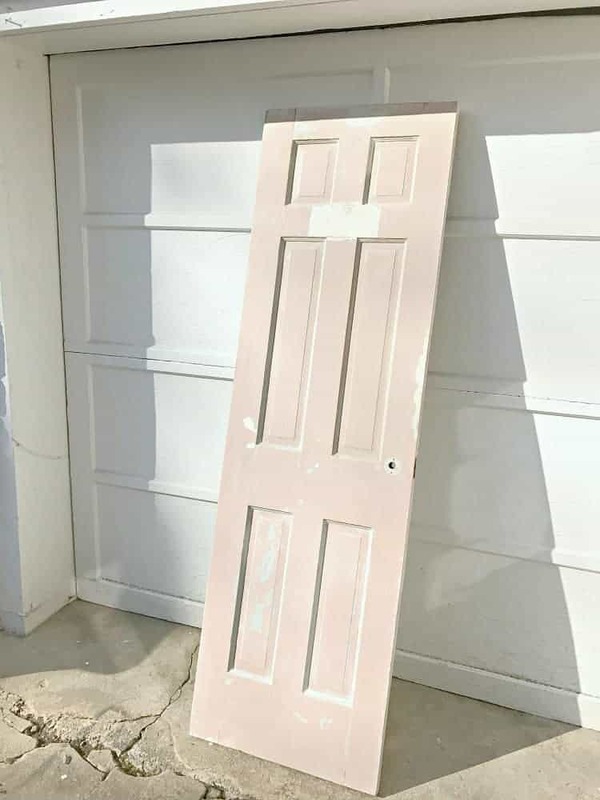 I’m sure it feels great to have that door project completed. 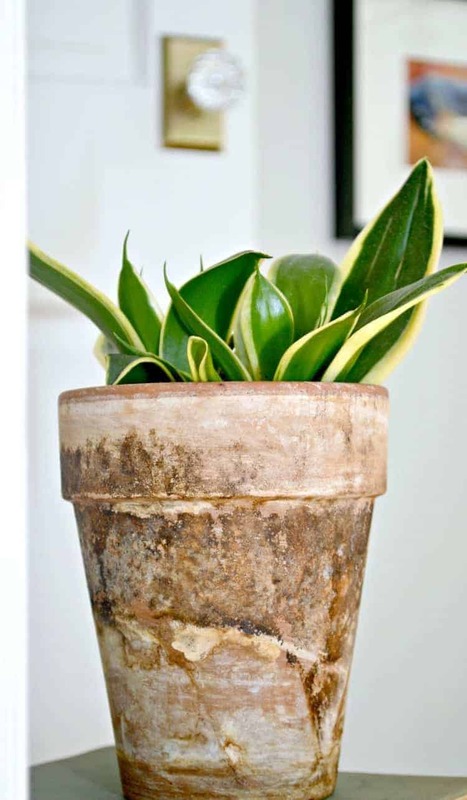 It may be low impact decorating, but it really does make a difference! And that doorknob hardware is great. Have a good weekend! You guys did a great job bringing that old door back to life. It looks wonderful and nearly brand new. Of course your new door knob takes it to another level and I’m still amazed at how you made your fireplace mantel look as though it was originally made with a two level wood piece. You guys are so good. I absolutely love everything you’ve done there. Thanks so much Pat, I appreciate your sweet comment. It’s been a challenge but we’re learning a lot and slowly making progress. I’m happy with the way it’s shaping up in the living room. Thanks for following along. Hope you have a great weekend! I totally get the old = nothing is perfect thing! Been there. I just call it charm and your door has tons of it! 🙂 Great knob! Hope you’re getting some nice spring weather. Happy weekend! I say wow because if I had seen that door I would have run the other way. LOL I can’t imagine you looking at that door every night. 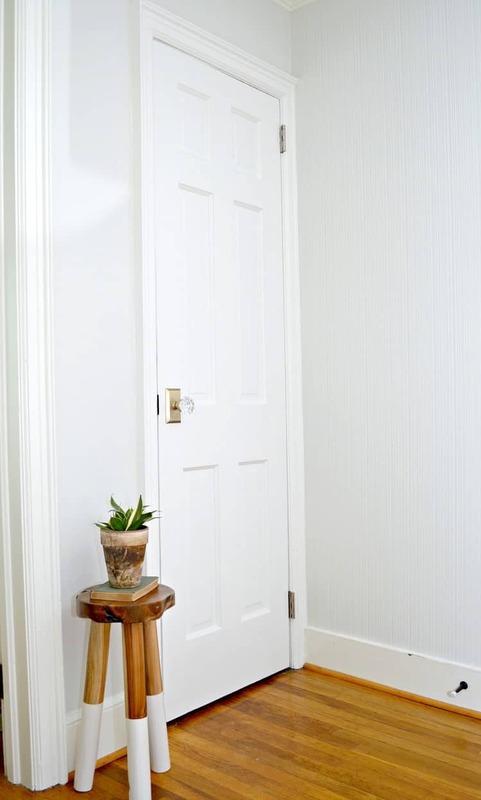 Great job on the refinish of an old door. I look forward to your pictures from the antique flea market. This week end I am going to try and install the window AC in my studio. Wish me luck, because I will need it! Hope you have a great weekend Debbie. Good luck with putting your AC in.